Scholarships change lives. Jesus, Monica and Gloria say the scholarships they received from CICF have changed their lives, as well as their parents and, in Gloria’s case, her two sons. These three smart and talented students sat down with For Good to talk about what it was like to set foot on a college campus for the first time, their surprise at the cost of books, advice for scholarship applicants and their plans for after college. If you enjoy this episode, subscribe to For Good through your favorite podcast app and leave us a review! Transcription of episode available below. LAURIE BURNS: I am Laurie Burns, community collaborations and impact analyst at CICF. I am honored to be here today with Monica Hardy, Jesus Marciel and Gloria Turner, three incredible individuals who have each received a scholarship from CICF. You all know me, but probably not each other. So let’s start with introductions, the scholarships you received, your school and your major. Monica, will you lead us off? MONICA HARDY: I received the TeenWorks Scholarship. I go to University of Indianapolis. I’m a junior and I’m majoring in art education. GLORIA TURNER: I’m Gloria. I’m IUPUI. I’m studying social work and the scholarship I received was Reach Your Potential Scholarship. JESUS MARCIEL: Hi, my name is Jesus Marciel. Some of the scholarships I received include the La Plaza Scholarship, the Mexican Consulate Scholarship, Reach Your Potential Scholarship, The Michael and Anna Kurty Scholarship and the SADCO Scholarship. I go to IUPUI and I’m a senior in electrical engineering program. LAURIE: Great. So I’d like to start by asking all of you what motivated you to go pursue your degrees at your respective institutions? GLORIA: I was a transfer student from Ivy Tech and I learned about the opportunity to transfer from Ivy Tech to IUPUI, I thought that it would be a great opportunity to show my children that I could go further beyond my associate degree and then pursue my bachelors. Ever since being at IUPUI, I’ve grown so much and I feel like being a nontraditional student, being there and being in that space gives other people a look at, “Wow, you’re going back to school, maybe I can do that too.” And so I try to share my story with other people and let them know that they can do it just like I’m doing it as well. LAURIE: What about you, Jesus? JESUS: Well growing up, my family and I lived paycheck to paycheck. And so college was not always on the table. So at the point that I got to my senior year, I knew I had to do something to even make it a little bit accessible. I wasn’t looking at my next car. I was just looking to make it accessible and I just needed, I just wanted to go. I wanted to get an education. MONICA: So does everyone know what TeenWorks is? So it is a summer program. Through working there, you are also eligible to apply for this scholarship. And I have a twin sister, so it was, we kind of needed a sense of scholarship monies to, like, help us be able to go. I found myself applying. LAURIE: So I’d love to circle back to you Gloria. CICF is trying to support more adults that want to return to pursue credentialing. So, what’s it been like going back as an adult to school? GLORIA: It was very challenging because as nontraditional student having a family and also working full time and going to school full time is a lot to manage and to juggle. But I knew that at the end of the day, the sacrifice was going to pay off in the end. LAURIE: What do you wish other adults returning would know before they start that process? GLORIA: One thing that I would like nontraditional adult students to know is that just because you didn’t get to graduate traditionally or go back to school, there’s no cutoff. There is no law that says when you cannot return. And then to surround yourself with like-minded people. You will find a lot of motivation and empowerment when you get around people who want the same thing that you do. It’s still a challenge but I still work hard each and every day because I know that it’s not just going to impact me and my life, it’s going to impact the lives of my children so that when they do get of age to go to college, they can never say, well, mom, you didn’t do it. They’ll never be able to use that as an excuse because I was able to do it. And I want to be that example for them. I want to show other people that they can be that example for their children as well. LAURIE: I can imagine how proud your boys are of you knowing how proud we are of you. GLORIA: They are. My oldest son, he asked me all the time, what did you learn in school today mom? And he’s even visited colleges. And the conversation in our household has changed so much. Growing up, college was also not a conversation. It was basically survival. Now the conversation has changed from what job you’re going to get to what colleges are you going to go to. My son has already picked out a major, the school he wants to go to and he’s taken the necessary steps to getting scholarships already at 11 years old. And so, I’m seeing the impact that I have now and I hear him talking to his friends, and it’s just energy that I want to keep continuing to project. LAURIE: I love that. Jesus, you spoke earlier about not having that atmosphere of college going in your family before you went to college. What’s the support been like or what resources other than the scholarships have you really sought out to help support you as you pursue your goal? JESUS: There’s been a lot of local organizations around Indianapolis that have provided a support network. For example, with La Plaza when I was a high school senior, I set up meetings with advisors there and they led me through all the scholarship packets in addition to La Plaza. Brothers of Another Color is an organization in the Wayne Township community that starts in middle school where they sort of, they begin by recruiting minority males, and that network continues on throughout high school. I was one of the first members of that group, and since then, it’s grown to over 100 people. Now they recruit all ethnicities between 12 and 23 and they’ve really helped me out a lot. The first class that graduated from high school, I think we had like a 90 percent college placement rate or something. JESUS: Yeah. And so coming from an inner city school, and then all these guys that look like me and I know all really well, they all go to college and they all want to succeed, really inspired me to succeed. So, that was cool. LAURIE: Monica, you spoke earlier about TeenWorks and how it provided you with summer employment opportunities. What do you think was the best thing you learned from your TeenWorks experience that helped you while you’ve been in college? MONICA: I feel like I learned teamwork and a lot of just professional development skills. While you’re in that program in the summer, you have to make a professional email address, you do mock interviews and you build your resume. All that has like translated and carried with me to college. I remember my freshman year of college, everyone was like, how do you even make a resume? I’m like, I already have one so I thought that was pretty cool. LAURIE: So what was it like for all of you when you first walked onto your campus? That moment that made you feel like, I’m really here and I’m really a college student? GLORIA: This is Gloria. For me, I work full time and so a lot of my classes are online. So, having that firsthand on campus experience, I don’t get the same experience as everyone. However, when time permits, I try to be as engaged in on campus activities as much as I can. But for the most part, I don’t get to have that advantage because I work so much. But when I first stepped foot on there, I said, wow, I’m really here at a four year university. I’m going to do this. And I actually took my sons with me when I went the first day. MONICA: This is Monica. For me, I was scared because it was my first time being apart from my twin sister and I was like, I’m by myself. But also, it was just very exciting because I was like, oh my gosh, I’m like really an art student. And I was super excited for what like adventures that was going to have for me. LAURIE: Jesus, at the beginning, you identified how you had multiple scholarships from CICF. I think you’ve received one every year that you’ve applied and in each year you’ve been in college. So what kept motivating you to keep applying for scholarships? JESUS: Well, like I mentioned earlier, at first, it was about making college accessible. It was about being able to afford college and not having to put that financial burden on my parents. Some of the scholarships that I mentioned earlier expired after a certain amount of time. And so, I think it was my junior year where I stopped receiving the Reach Your Potential Scholarship and realized, well, that takes a huge chunk out of my pocket. So I just had to keep doing it and continue to make college accessible. LAURIE: Well, I’m glad you did because CICF has several scholarships that are only available to students already pursuing their degrees. We usually receive less applicants than some of our other scholarships because college students don’t realize that they still have opportunities to receive funding moving forward. JESUS: I agree. I think a lot of people are unaware of how much free money there is out there. All you really have to do is apply. LAURIE: So we’re actually in the middle of our open application rounds right now for some of our scholarships. What advice would you give to those submitting scholarship applications? JESUS: This is Jesus. I would definitely say be honest, be open. Put your desires, your feelings, wishes out there for the scholarship committee to see because that’s what’s going to, I feel like that’s what’s going to set you apart from, I want to go to college because that’s my dream. Instead talk about why, your own unique story, what’s going to set you apart, and don’t be afraid to put yourself out there. MONICA: This is Monica, and I think an important thing when you’re applying, show your growth, especially if you have an interview process, this is definitely the time to sell yourself. Don’t be too modest. You have a 3.8 GPA, say that. GLORIA: This is Gloria. It’s very important to dive deep into your passion. Before you start the essay process, maybe get a piece of paper to write down all of your accomplishments and all of your barriers so that when you’re diving into that essay, a lot of times if it’s 500 words or less, you can’t put your whole life story, but those key points that it’s going to gravitate to the reader because if you are applying for a very competitive scholarship, I need to see a story. I need to see a where you want to be, what you’re trying to do and narrowing down, putting smart goals, having exactly what you want to do tells that audience, wow, this person is really ready and they want to do something. Having someone proofread what you wrote, getting input from other people, they may be able to see something that you didn’t see and pick that up because you want to put your best foot forward when you’re turning it in. LAURIE: That’s great advice. Scholarship dollars, I know, have been beneficial to all of you but I think I can say that it doesn’t cover all of your costs associated with going to school. Can you talk a little bit about the expense side of college that surprised you? JESUS: I grew up on free and reduced lunch, so that also meant free textbooks. When I had to buy text books for the first time, I was like, whoa, why are they so expensive? That was one expense that really caught me off guard was $500 textbooks, multiple textbooks which amounted to multiple thousands of dollars. That was nuts. GLORIA: It was just for me just the time. I hadn’t known how much that was going to cost me in terms of the sleep that I would lose ensuring that I had something turned in on time. LAURIE: Makes me glad that CICF scholarships largely can be used for expenses beyond just tuition. Gloria, talking about time and being tired, what’s it like pursuing your degree and your career that you currently have plus being a mom? GLORIA: It’s hard, but I make it work every sleepless night, every paper that I turn in. Making sure I’m able to provide for my family financially. But the struggle, it’s hard, but if you think about what it’s going to award you later on down the line, it’s worth it. Now I’m more active in the community. I volunteer my time, which is so gratifying and it’s even rubbed off on my son. So like, I’m seeing now that everything I do truly impacts everything that he does. I’ve developed time management. That’s one of the biggest things that I’ve had to do with juggling everything. I set aside my homework each day. I do so much homework a day, so I’m not doing it all on Sunday night before 11:59. And then also, I talk to my employer. I let them know, hey, I’m still a college student. Communication is key. Communication and time management. LAURIE: So, Monica, has that balance existed for you between the fun things that you want to do and going to classes and completing all your art projects and being prepared for class? MONICA: I make it work. Time management, it’s hard because every semester your schedule changes. This year, I’m an RA, resident assistant, and then I also have an off campus job. But at the end of the day, you just have to remember, hey, you’re a student and that’s what’s coming first. These part time jobs, that’s not where you want to stay. So, that kind of like motivates me to say, hey, get your homework done. JESUS: My freshman year at college I was working a lot my part time jobs and I was getting really stressed out because all my friends were going out all the time, going to parties and I had to go to work. Or they would go out to eat and I had to go to work. But pretty soon, I figured it out. I kept the planner, I started tracking my expenses. And four years later, I’ve definitely reached a balance that I enjoy. I have a growing social life that I didn’t have before. I’ve gotten into a lot of artistic projects which is really neat because being surrounded by analytical people all the time, it gets bland, it gets stressful. So I started adding some color to my life. LAURIE: Gloria, as an adult student, creating community looks a little different, particularly when you’re taking online classes. So what has it been like for you? GLORIA: Well, I’ve tried to do my best with meeting people who share a similar lifestyle as I do because we understand each other’s struggles. Some of the friends that I had coming from Ivy Tech are now at IUPUI. And so we stay in contact and we kind of talk about things that we’re dealing with. We’ve kind of started a peer mentoring within our own community. So that’s been very helpful because there’s times that I’ve felt really down and wanted to give up because it’s easy to give up. It’s easy to throw in the towel and say, you know, I’m finished because you don’t have to take on the stress. But, I try to contact them at least twice a week and we talk regularly. That’s how I stay in touch with my community. LAURIE: I love hearing that you guys are creating that network or that peer mentoring within your social group. What has having this scholarship meant for you all as you go through your college experience? Gloria, can we start with you? GLORIA: Sure. It’s definitely been life changing for me. I am a 21st century scholar and as that scholarship ran out, I was really worried that what was I going to do because I’m not in a position to pay for college out of pocket and still keep my life going. So, when I received word that I received the scholarship, it completely changed everything in that moment because for that moment I didn’t have to stress. I didn’t have that financial burden associated with my educational journey. I could focus on everything else that was going on in my life that I needed to take care of. So, for me, it definitely was life changing to receive that phone call. JESUS: I don’t really think you can summarize what a scholarship means because it can mean so many different things to so many different people. To Monica, a scholarship means one day being an artist. To Gloria, that’s a heroic mother to her kids. For me, it meant a professional network, social group that helped me develop academically. It meant exploring interests that I didn’t know I had. It meant relieving my parents of a financial stress that they didn’t need, that they couldn’t take on. So I don’t really know how to summarize what a scholarship means without going into detail of everyone and everyone’s struggles and my struggles and everyone’s successes are my successes. LAURIE: So, the question I always get from donors and those that contribute to the scholarship funds is what happens to you all after you graduate. Where are you guys 10 years from now? GLORIA: This is Gloria. 10 years from now, I hope to be owning and operating my own nonprofit organization geared towards helping to mentor nontraditional students by utilizing my story to empower them. But definitely in 10 years, to see my son off to college and then just seeing positivity surround me. MONICA: This is Monica. Definitely, I want to be doing something I’m passionate about. Definitely, I want to still be doing art. Hopefully, I’m still an art teacher. I really want to inspire a lot of kids, to show them that creativity is still an important role and aspect of society. LAURIE: Jesus, you look like you’re ready to answer that question. JESUS: 10 years from now I see myself hopefully doing something that I enjoy. I don’t know what that’ll be yet. Maybe it’ll be pursuing a film degree because I really like film. Maybe it’ll be pursuing an MBA, maybe it will be starting my own business. I don’t really know. I just hope it’s something that I like. And also somehow giving back to the community in whatever way that I can. LAURIE: Each of you have a bright future ahead of you and I’m so happy that CICF has played just a small role in this journey that you’re taking. I really hope your stories will inspire others to reach their full potential and I know that they have already in some cases like Gloria’s son. Thank you for joining me today. We appreciate your time. 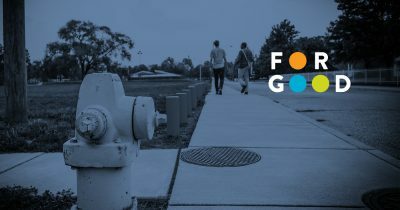 In this special episode of For Good, Brian Payne talks about dismantling systemic racism—one of five of CICF's leadership initiatives for Marion County—and how it is impac…Read More.